In the United States, gun ownership is still a hot button issue. A 2014 study in the Annals of Internal Medicine reported that having a firearm in the home puts those in the household at higher risk of committing suicide or being the victim of a homicide. And approximately one third of American households keep at least one firearm in the home. For the first time, more gun owners say the reason they own a gun is for protection, not hunting. Women who live in a home with a gun are more likely to be victims of homicide. Men who live in a home with a gun are more likely to be victims of completed suicide. Over 40 percent of homicide victims know their perpetrators. The majority of Americans believe that stricter gun laws would reduce mass shooting and accidental gun deaths. The majority of Americans also believe that stricter gun laws would make it harder for citizens to protect their families, and give the government too much power. When it comes to children, many unintentional gun injuries and deaths are the result of one child shooting another while playing with an unsecured, loaded gun. Handle with care: Always keep your gun’s muzzle pointed down and away from people and objects. Never leave a gun unattended, and never allow young children to touch or handle guns. Store guns properly: Guns should be unloaded, locked and stored separately from ammunition in a gun safe, cabinet, or other secure location. Ammunition should also be securely stored. Wherever you choose, make sure the container is locked and truly inaccessible to children; hiding your gun is not enough. To find out how to get a free gun safety kit, go to www.projectchildsafe.org. 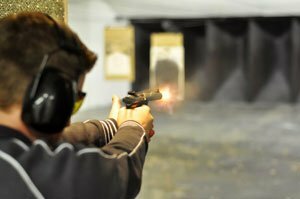 Educate your family: It’s a given that every handgun owner should be properly trained on how to safely handle a gun. But it’s critical that everyone else in your home has gun safety training too. According to the Center for Injury Research and Policy, most children know where their parents’ guns are kept, and even a three year old is capable of pulling the trigger on a modern firearm. Additionally, kids should be taught that it’s not OK to “play” with a real gun. Remember, understanding gun safety procedures are not enough: Many gun accidents can be attributed to carelessness, not lack of knowledge. Make a commitment to gun safety and do your part to prevent gun accidents in the home. For home insurance questions, call or contact Consolidated today.